Have you ever wondered if you and your children follow any table manners at all? Most of us give this a thought when we are in the middle of a family gathering, holiday meal or a formal get-together Whether you are at a restaurant or you are invited home as a guest, here are some basic table manners you can follow and also teach your kids. • Wait until all are served at your table before beginning to eat. • Take your children to a nice restaurant and allow them to order their own food. • Avoid burping at the table in the middle of a meal; Remember kids are good at mimicking what parents do. • Your hands should always reach to your mouth. Never lift your plate up. • Ask politely for dishes to be passed. • Chew with your mouth closed. This includes not talking with your mouth full. 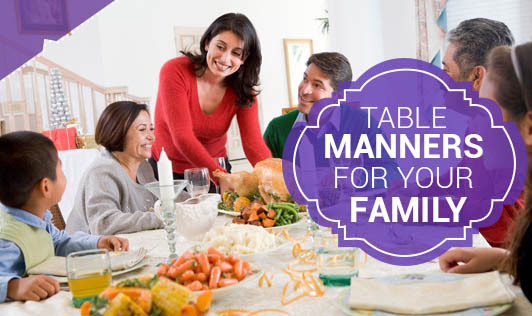 • Make sure not to leave the table before the host or the eldest person has finished their food.Leaving the table without asking for the host's or the elder's permission is considered impolite. • Participate in the conversation and try not to interrupt when other people are talking. • Don't make any rude comments about any food being served. It not only hurts someone's feelings but also kids tend to learn the same thing from you. • Always say thank you when you are served something. It is a mark of showing appreciation. • Try not to pick anything out of your teeth. Try to excuse yourself and go to the restroom. • Clear your plate from the table and take it to the kitchen after dinner. • Always make sure you thank the host and tell them how much you enjoyed it. Mention a specific item that was particularly tasty. • Children specially do not learn proper table manners overnight. It takes years of repetition and consistent training to refine their skills. So practice regularly. • Try to have a more formal dinner once a month. Dress up, serve a special meal, make good use of the good plates and utensils which you have stacked in your cutlery show case. Happy Dining with your family!!! !